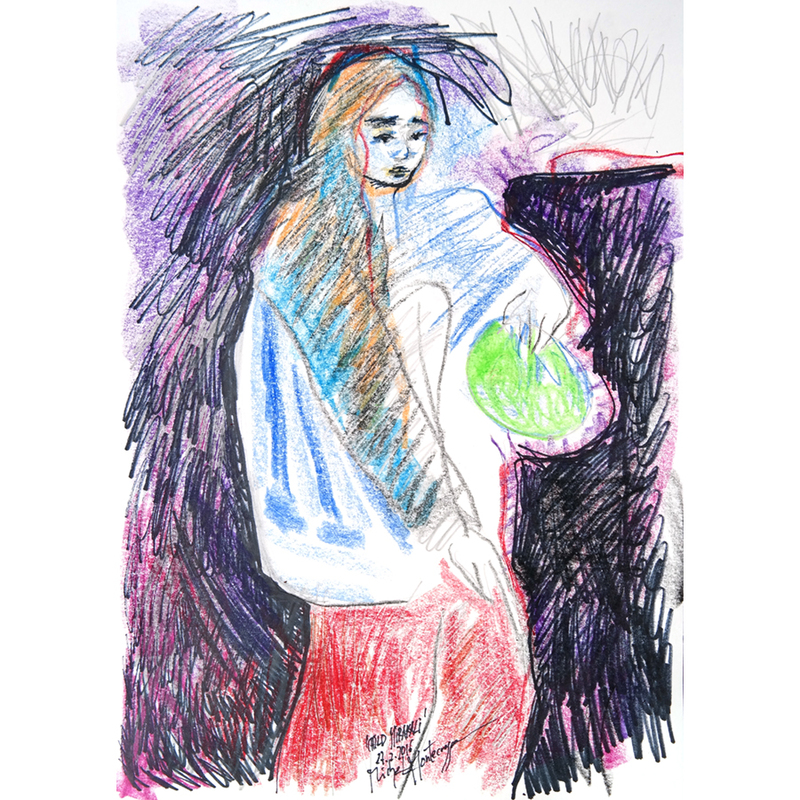 Michel Montecrossa from Mirapuri-Coiromonte, Italy; is a visual artist who paints, draws, uses photography and creates film; as well as a philosophical and fictional writer and poet – who is also a musician. Michel has chosen the subject of Heterosexual Privilege for his submission for issue 4 of ASLI Magazine: “Discrimination, Privilege and Stigmatisation”. My aim in life is to grow in consciousness to a fulfilling completeness. Based on this aim I chose to become an integral artist that perfects his natural artistic capacities in fine arts, music, literature, movie-making and consciousness-research. I received a good education in these fields through schools and private teachers as well as extensive travels for the study of Eurasian and U.S.A. cultures. Out of this formative process a clear and intense certitude about the human potential emerged, a certitude about the fact that a better tomorrow is created by growing and entering into a new consciousness that among many things can change the heterosexual privilege of dominance into a tolerant and creative spiritual & social power for establishing and securing freedom of choice for all sexual expressions and preferences – this would be a step of great cultural importance; liberating in all aspects of human life, hidden and suppressed creative springs. The process of creating is an evolving and self-creative synthesis of all possibilities with drawing, painting, music, writing and movie making that are embedded in my state of continuous consciousness-researching. The artist, musician and consciousness liberation fighter Mira Alfassa. The Great Consciousness that can be felt and seen in all creation as well as in all that transcends it. I have dedicated my life, work and art to help to build Mirapuri, the City of Peace and Futureman in Europe, Italy. “Art saves lives” because art connects us to the very principle of life which is consciousness showing us the meaning of life and how to live this meaningful life. For the same reason “art creates change”. My artistic and creative outlets saved my life through steadiness and through the message of hope contained in them. It is the message of hope that the world is in the process of a big change and that every action of goodwill can and will accelerate the speed of this change into a new step of evolution giving birth to the Futureman of Joy and Love and the building of the United States of Planet Earth for securing peace and creative world unity. Have you experienced any form of discrimination; and if so what was it based on and how did you deal with this? As a free and living soul one is always in contact with discrimination which is based on unwillingness to change in harmony with the constant changes of the universe. One can deal with this by being an example for the Joy and Love that come through every step of widening the consciousness, understanding and compassion. What are your opinions on what causes discrimination? The cause of discrimination is conservatism and fear. They are the testing-grounds for every new step of evolution so that the new things can prove their effective right and capacity to replace old orders through love, peace, prosperity and security. What do you do to actively stand against discrimination and have you ever had to intervene as a witness to it? To be an artist means to actively stand against discrimination by showing the better way of wideness, freedom and love. To follow this way is a constant intervention for the better of all. What are your opinions on labels and stereotypes? Labels and stereotypes are reactions of fear. Empathy, humour and joy can transform fear into a happy ‘Let’s play together and have a good time’. What are your opinions on national identity and in your opinion does nationalism create or deter discrimination? National identity is good and necessary, if it is an identity that has its goal within a world union, the achievement of unity in diversity where each nation plays its indispensable free and self-determined role in the concert of the United States of Planet Earth and its well-being. Nationalism for its own sake is destructive and discrimination-driven. How does social privilege affect our world in your opinion? The true privilege is to know always more and to be able to do always more. If this privilege is activated in a non-egoistic way, it will lead our world in a positive direction. Have you ever denied your own privilege due to feelings of guilt or misunderstanding? To be conscious of the soul is a constant source of happiness where there is no guilt or misunderstanding. Have you ever experienced social stigmatisation and if so what was it based on and how did you deal with this? Social stigmatisation may come about to learn better how to transform it into higher understanding. So, the best thing is to reach higher understanding. Have you ever contributed to the stigmatisation of any individual or group, and if so were you aware you did this and how did you deal with this aftermath? Everything and everyone has a right for existing for some time whether you like it or not. The best thing is to learn from it and thus grow in consciousness so that the wrong things are not repeated and good things become real. What are your opinions on political powers and world leaders using stigmatisation against certain groups to further their own agendas, such as with Muslims, Black people, LGBTQ individuals, mentally ill and disabled people? Political powers and world leaders must be there to lead to freedom and unity, to the experience of a progressive world where everything is in its right place and time without quarrel and arrogance, full of goodwill to help each other and ready for the living celebration of humanity. Do you support or take part in any anti-stigma organisations or charities and if so which ones and why? I support and take part in the building of Mirapuri, the City of Peace and Futureman in Europe, Italy because it is an important anti-stigma organisation and warmhearted charity project. In your own words please tell us how you feel the arts and creativity can further help to empower, communicate and educate people with regards to discrimination, privilege and stigmatisation? Art and creativity are straight roads out of discrimination, false privileges and stigmatisation because they empower you, communicate to you and educate you through the true, the right and the vast of your loving soul. This year’s Spirit of Woodstock Festival in Mirapuri, Italy takes place from 19th to 23rd July 2017 – looking forward to meet you at the Festival! 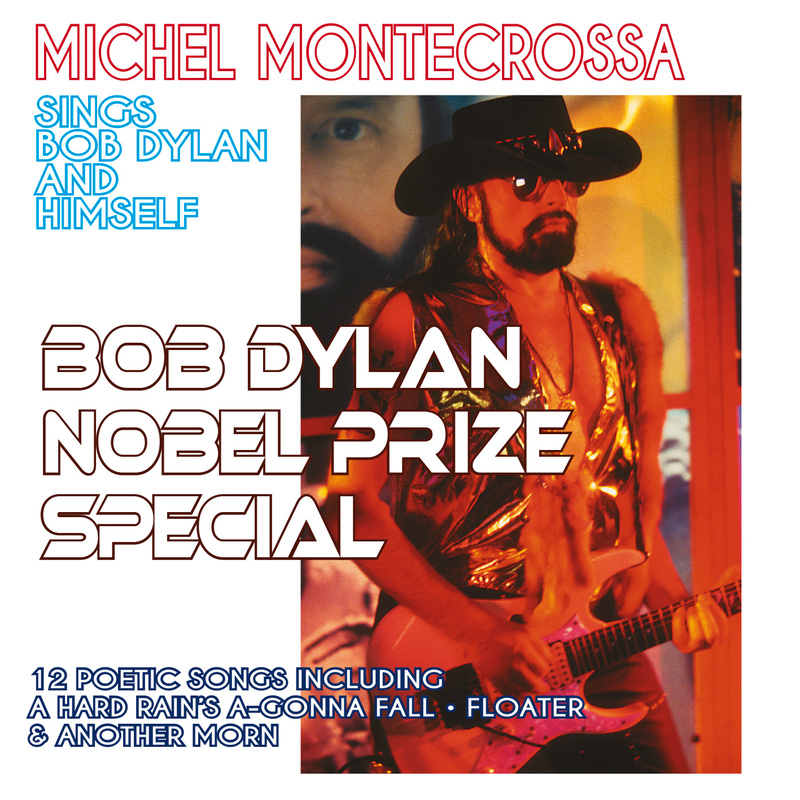 ‘Bob Dylan Nobel Prize Special – Michel Montecrossa sings Bob Dylan and Himself’ is released by Mira Sound Germany on Audio-CD, DVD and as Download celebrating the awarding of the Nobel Prize in Literature to Bob Dylan “for having created new poetic expressions within the great American song tradition” on 10th December 2016 in Stockholm, Sweden. The ‘Bob Dylan Nobel Prize Special – Michel Montecrossa sings Bob Dylan and Himself’ presents the outstandingly revealing performances of 8 Bob Dylan songs, 1 Robbie Robertson song and 3 Michel Montecrossa songs all played by Michel Montecrossa and his band The Chosen Few including Bob Dylan’s legendary songs ‘A Hard Rain’s A-Gonna Fall‘, ‘Chimes Of Freedom‘ and ‘I’ll Keep It With Mine‘ as well as Robbie Robertson’s ‘Golden Feather‘ and Michel Montecrossa’s ‘Another Morn‘. Robbie Robertson for many years played guitar for Bob Dylan and was an important co-creator of the typical band sound that accompanied Bob Dylan’s song music on its way to international fame. Michel Montecrossa today is one of the most important voices for new interpretations of Bob Dylan songs. He by now has recorded all the official releases of Bob Dylan songs as well as unreleased songs and songs of other artists which Dylan performed during his concerts and presents every year at the famous Spirit of Woodstock Festival in Mirapuri, Italy a special day dedicated to the songs of Bob Dylan under the title ‘Michel Montecrossa’s Michel & Bob Dylan Fest’. Michel Montecrossa himself is a great 21st century New-Topical-Song writer, musician and composer who created more than 2500 songs and modern-classical symphonies and also is the author of many fiction, philosophy and poetry books as well as producer and director-actor of futuristic Cybermovies. 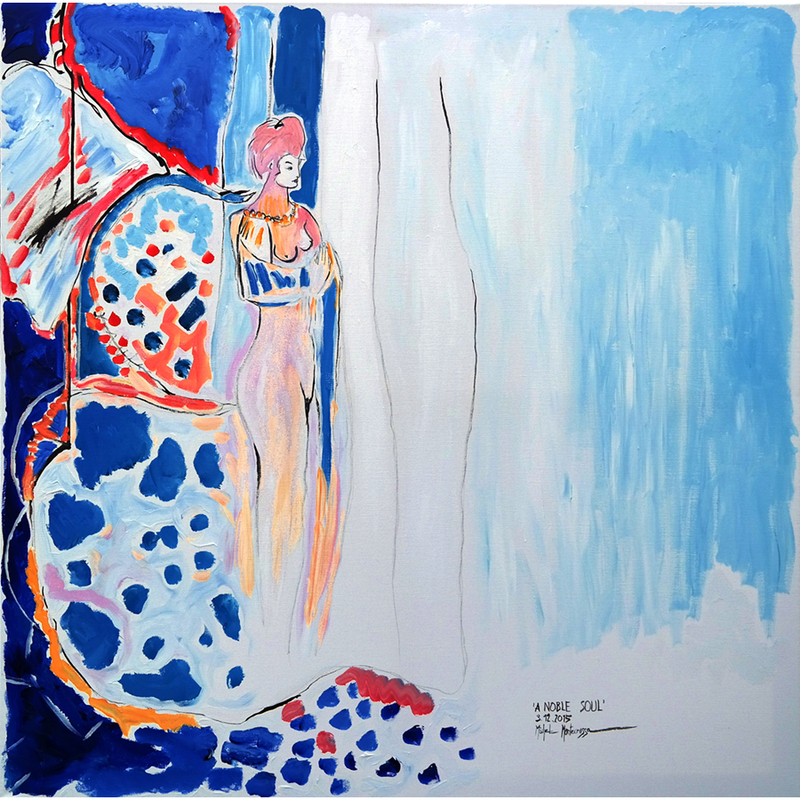 Michel Montecrossa furthermore works as revolutionary artist presenting a continuous flow of paintings and drawings which can be seen in permanent exhibitions in Germany as well as in Italy. As an active humanitarian consciousness researcher he has founded Mirapuri, the City of Peace and Futureman in Europe, Italy as an open-ended experiment for human evolution. The song ‘A Hard Rain’s A-Gonna Fall’ which is the opening song of the ‘Bob Dylan Nobel Prize Special – Michel Montecrossa sings Bob Dylan and Himself’ was also performed as the opening of the Nobel Prize Award Ceremony. On that occasion it was sung by Patti Smith. Michel Montecrossa’s orchestral interpretation of ‘A Hard Rain’s A-Gonna Fall’ is based on Bob Dylan’s own orchestral version of the song which he staged during the ‘Great Music Experience Festival’ 1994 in Japan. “Well, I’ve been doing what I set out to do for a long time, now. I’ve made dozens of records and played thousands of concerts all around the world. But it’s my songs that are at the vital center of almost everything I do. They seemed to have found a place in the lives of many people throughout many different cultures and I’m grateful for that. 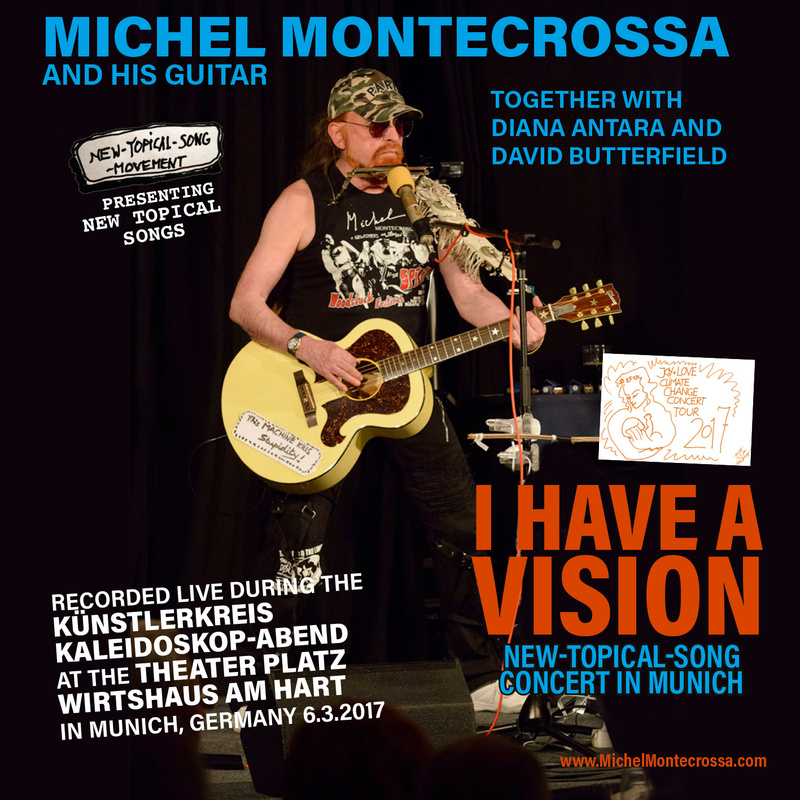 Michel Montecrossa’s ‘I Have A Vision New-Topical-Song Concert in Munich’ on 6th March 2017 at the Künstlerkreis Kaleidoskop-Abend, is released by Mira Sound Germany on Audio-CD, DVD and as Download. 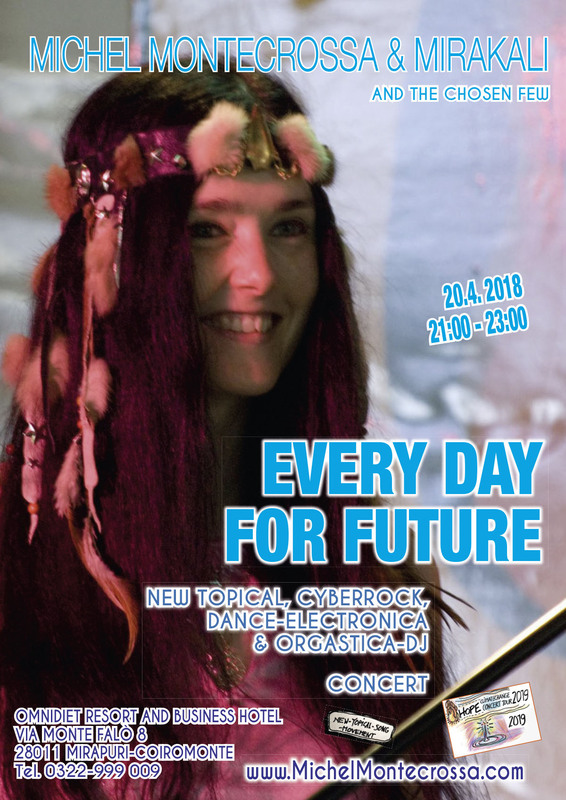 The concert presents 5 great New-Topical-Songs by Michel Montecrossa: ‘I Have A Vision’, ‘Angela Must Act Now – Angela Muss Jetzt Handeln!’, ‘Talking: Theresa May, Give Back The European Unity! – Ich Sage: Theresa May, Gib Zurück Die Europäische Einheit!’, ‘Is Schulz The Hero? – Ist Schulz Der Held?’, ‘With Love And Freedom Into The Future’. Day One after seeing nights. Day One after the blackest night. Tag Eins nach sehenden Nächten. Tag Eins nach der schwärzesten Nacht. Tag Eins nach träumenden Nächten. Day One after dreaming nights. Tag Eins des wahren Lebens. Day One of the true life. Day One of the adventurous life! Night länger im Kreis sich drehen. Nicht länger verloren im Chaos-Spiegel. No longer lost in the chaos-mirror. Sänger bin ich der nackten Wonne. Singer I am of the naked bliss. With you I am total magic. Mit dir bin ich Zauber total. I am gold for you and the wisdom. Bin Gold für dich und die Weisheit. Day One after flaming nights. Tag Eins nach flammenden Nächten. Day One of our beautiful world. Tag Eins unserer schönen Welt. Nicht länger nur reden. No longer just talkin’. Tag Eins nach sehenden Nächten. Day One after seeing nights.